At age 22 she met Anne Eugenie Milleret in Paris and soon was part of the small group of young women who formed the first community of the Assumption in 1839. She took the name Mother Thérèse Emmanuel and is considered the co-foundress, with Saint Marie Eugénie, of the Religious of the Assumption. In her life, Mother Thérèse Emmanuel had two great loves -- Jesus Christ and the Assumption. She loved Christ, the Word who spoke so much to her, the Lamb at the center of the liturgy on earth and in heaven. And the Assumption, how could she not have loved it? 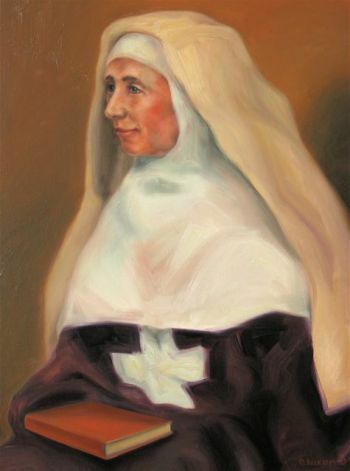 She gave it all her strength by being at the side of Mother Marie Eugénie during its slow birth and painful growth and by forming the novices day after day in the joy of belonging to it. As a sister and intimate friend of Marie Eugenie and particularly as novice mistress for over forty years, she formed generations of sisters in the interior life which is the heart of the Assumption spirit. For more information, download this biography of Mother Thérèse Emmanuel.